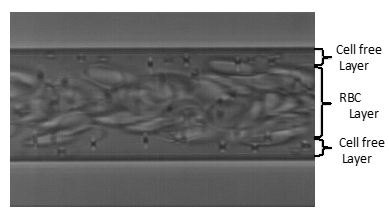 Fig.3 RBC axial migration in a circular glass capillary with 25 µm in diameter. 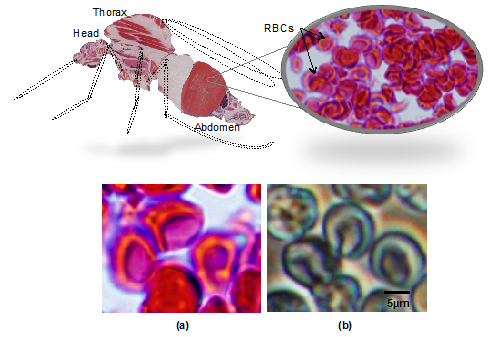 (1) Jahan, N., Docherty, P.T., Billingsley, P.F., and Hurd, H., “Blood digestion in the mosquito, Anopheles stephensi: the effects of Plasmodium yoelii nigeriensis on midgut enzyme activities”, Parasitology, Vol. 119, (1999), pp. 535-541. 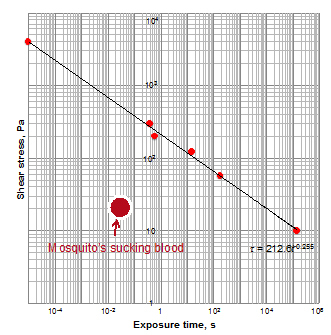 (2) Kikuchi, K. and Mochizuki, O., “Micro-PIV visualization of red blood cells sucked by a female mosquito”, Measurement Science and Technology, Vol. 22, No. 6, (2011), 064002 . (3) Akaki, M. and Davorak, A.J., “A chemotactic response facilitates mosquito salivary gland infection by malaria sporozoites”, The Journal of Experimental Biology, 208, (2005), pp. 3211-3218.